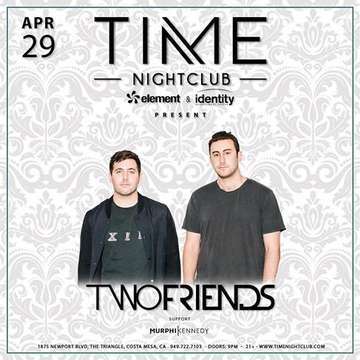 Saturday April 29th, join a group of SD & OC #BAE's as we head to TIME Nightclub for the road trip of a lifetime! If you are coming from SD we have a LUXURY transportation package complete with Hummer limo and a champagne toast, leaving from the Ross Parking lot, Mission Valley or call an Uber and claim your VIP or Comp entry ticket. Limited seats in the limo so buy now! Whichever route that you choose, after a scenic trip up the coast, your VIP experience starts at 10pm and will go until 2am. Claim your ticket and step into a world of electric, mood enhancing sound provided by DJ's TWO FRIENDS + Murphi Kennedy. Reserve your spot today! Remember to wear your best Saturday night outfit and prepare for an experience unlike no other!